Lawrence Winters served as a U.S. Marine in the Vietnam War in 1969-70. The author of The Making and Unmaking of a Marine, he is a mental health counselor, and has returned to Vietnam to study PTSD in the Vietnamese people. He also has worked as Director of Veterans Treatment at Four Winds Hospital in New York. 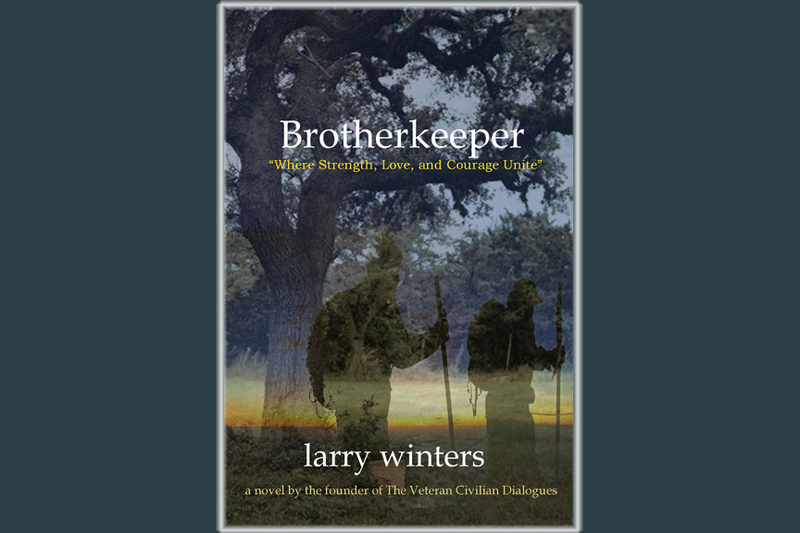 Brotherkeeper (294 pp., $21.95, paper; $4.99, Kindle), Winters says, is a novel that explores “the relationship of veterans to their families and communities.” In 2013, Winters read the works of Jonathan Shay on Vietnam veterans and PTSD, and “realized moral injury had been the reason my soul would not return home.” War’s affect on morality is a major theme in his book. Jake teaches high school, which seems a risky choice for a Marine veteran with PTSD. Disclosure: My father was a high school math teacher and a Marine Corps veteran—of Iwo Jima. He taught high school as a penance for having survived Iwo. I think perhaps Jake had similar motivations. This is another book in which the characters keep secrets. “He’d been seeing Sam, the therapist, for three years, and hadn’t told him he was a Vietnam vet with a chest full of medals. All they ever talked about was his father.” I was so annoyed when I read that passage that I almost quit reading the book. But I persisted. Another aspect of the novel that posed a serious problem for me was the frequent use of italics for no reason that I found justifiable. In Chapter 57, for example, there are twenty-three straight pages of italics. This is italics madness. A good editor would not have permitted this. One of Jake’s students wants to become a man by joining the Marines. He talks to Jake about that. Jake thinks that joining the Marines would be the worst decision he could make. Another character dynamic is Howie Watkins, the Marine Corps recruiter in the small town. He’s so troubled by his job sending recruits into harm’s way that he attempts suicide. Howie says that his job makes him feel like a contract killer. Alma, Howie’s wife, is deeply concerned about Howie—for good reason. A missing father, Shiloh, leaves behind a manuscript about his time in Marine Force Recon. That’s the 23-page section of the novel rendered in italics. Shiloh becomes an important part of the novel. Much is made of Indian sweat lodge ceremonies and their purification rituals. The sweat lodge ceremonies are accurately and respectfully portrayed. We get many of the usual clichés of Vietnam War novels: Marines don’t leave Marines behind, Agent Orange, Marines called baby killers, criticism of the Vietnam Veterans Memorial for being “an Asian design,” and others. But they are appropriate to the characters. Those looking for a serious novel about dealing with the moral injuries of the Vietnam War—and perhaps fans of the works of PTSD expert Edward Tick—will benefit from this book. Mark Pomeroy lives in Portland, Oregon, with his family. He was born in 1969, so he steered clear of service in the Vietnam War—but he was affected by it. 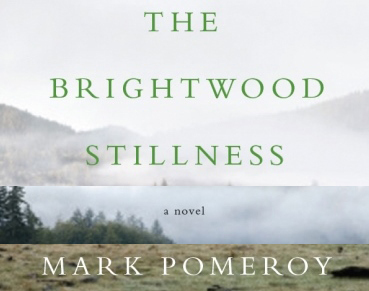 The Brightwood Stillness (Oregon State University, 280 pp., paperback) is his first novel. The book explores the legacy of the Vietnam War through the travails of two main characters: Nate Davis, who is on a quest to discover what happened to his uncle, a Vietnam veteran drifting around Asia since the war, and Hieu Nguyen, who fled the war with his family and came to the United State. Nate and Hieu are good friends; they both teach at the same high school. Hieu’s crisis is that two of his female students have brought charges of sexual misconduct against him. The book is set in 1996, so I guess it can be categorized as American historical fiction. This is one of those literary novels in which most of the main characters have secrets, refuse to speak their minds, and hold back vital information. Many misunderstandings take place. We find out that Hieu, for example, had fought with the VC in his younger days. And that Nate travels around the world looking for his uncle only to learn that he had been hiding in the family cabin a short distance away from home. When Nate’s uncle and Hieu confront each other late in the book, the uncle indulges in the usual trope about how ARVN troops were worthless. While the uncle is expressing contempt for the ARVN, all I could think of was that Hieu had been VC, not ARVN. Come on, Hieu, blow that bigot out of the water by telling him you were fighting for the ARVN’s enemy. But that doesn’t happen and Hieu’s secret is kept. That incident brought me close to throwing the book against the wall in frustration. On the other hand, Hieu’s silence is consistent with the rest of the book. So not only were the ARVNs “cowardly,” but I guess the VC were, too. Pomery does a good job letting the reader know about the problems that Vietnamese refugees faced when they came to the United States: the stereotyping, name-calling, and difficulties in getting jobs and holding on to them due to cultural differences. He has done a lot of research to produce this book, and uses what he found well. There, for instance, is the Coconut Monk, a hero of the Vietnam War who tried to set up a refuge from the war on an island. That only lasted so long, of course. I recommend this book to those who love to read literary novels dealing with the Vietnam War. The characters are well-developed and believable, if difficult to empathize with due to their own stubbornness. I guess that makes them all the more human. John Jennings’ ambitious memoir, Napalm and Filet Mignon (War Writers’ Campaign, 174 pp., $19.99, paper; $9.99, Kindle), loosely ties his experiences in Vietnam in 1969-70 to world events that took place simultaneously. Clippings from news stories, along with letters he wrote to his mother and sister, guide the reader through the book. Jennings tells us how he went from patrolling the hills and rice patties ten miles south of Pleiku with an Army infantry company that often got lost, to duty in the opulence of the Fourth Infantry Division Commanding General’s Mess. Along the way, the war profoundly affected him. The book’s stories illustrate many transformations that his service in Vietnam made in his life. Jennings approached the Vietnam War with little outward emotion. He remembers the names of a few fellow soldiers, but mainly he was a loner who did not develop friendships because of the constant turnover of personnel. He was in-country to serve his 365 days—period. Yet Jennings admits he did “just about anything for the guys [he] served with.” His performance under fire resulted in a promotion from rifleman to machine gunner in a matter of weeks. Being shot at scared the hell out of him, Jennings says, but it also brought him to a stage of rage he had never experienced. “I was completely astonished at this violent and uncontrolled anger that I felt,” he writes. 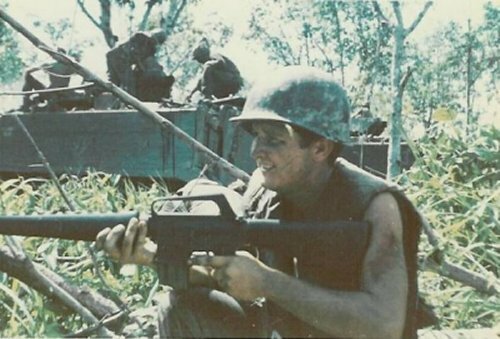 “It would come upon me so quickly that all I wanted to do was strike back and waste the gook.” The M60 machine gun was the perfect weapon to vent that anger. Unexpectedly, Jennings’ company commander selected him to compete for a Fourth Division Soldier of the Month award. Jennings faced off against two other finalists but did not win. Nevertheless, that experience led to the job of waiting on tables and tending bar in the Commanding General’s Mess. Guilt gnawed at him when his former company invaded Cambodia and he remained safely behind. The majority of the letters went to his 71-year-old mother for whom he soft-sold the war to ease her worries. Letters to his sister were more insightful. For example, on the same day that he wrote to his mother about a broken camera and the rain, in a letter to his sister, Jennings described a point man that a sniper shot in the head. “He died almost immediately,” Jennings wrote. “It happened so suddenly. Then with all the confusion and the screaming by guys crying for help, it shook me up a little.” The point man was the first American that Jennings had seen killed. That image has never left him. One of his letters about a sweep through a suspected VC village is a masterpiece of evoking the emotions and tension of soldiers and civilians during the operation. To me, those pages alone were worth the price of the book. Jennings also touches on some of the usual Vietnam War memoir topics: marijuana, Agent Orange, fragging, war protestors, My Lai, and falling in lust on R&Rs. He does not moralize. He does, however, puzzle over the frequent “wasteful loss of life,” which made him question his Catholicism and all other beliefs. After his discharge, psychologically burdened by the “graphic memories” of what he saw in the field and the guilt of working in the rear, Jennings drank his way through most of thirty-five years before he found help for his PTSD. Andrew R. Finlayson served twenty-five years in the U. S. Marine Corps. He did so, he says, because he “wanted the people I knew and loved in my small town to respect and love me.” His small town was Merchantville, New Jersey. Finlayson graduated from the U. S. Naval Academy in 1966, so his timing was good for service in the Vietnam War. His graduation “marked the end of four frustrating and largely unhappy years of academic and athletic struggle.” We get little additional information about those four years. This reader would have appreciated more. He went from the Naval Academy to Quantico, and did not fall short there. Far from it. Finlayson calls his participation in the Vietnam War “the one great lyric passage of my life; everything else I did in my life paled in significance. “ He spent thirty-two months in Vietnam, fighting in three distinctly different combat roles in two geographical areas. Finlayson’s men were the most productive team in the 1st Force Recon Battalion “with more sightings, more enemy killed, and more weapons captured.” He actually was reprimanded for the number of firefights and ambushes he took part in. “Your job has always been to conduct reconnaissance and surveillance operations or to conduct Stingray operations, not ambush patrols,” Finlayson was told. He disagreed. 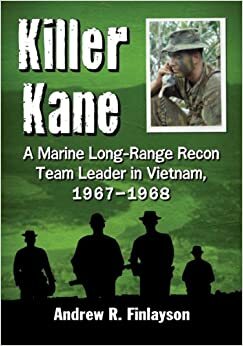 If you are seeking to read about Marine recon from a lieutenant’s point of view, this is the book for you. Killer Kane was the name of Finlayson’s team, and it was taken seriously. Finlayson is more than once accused of being a cold-blooded killer. There is less of the usual clichéd stuff in this book by far, but we do get mentions of John Wayne, Iwo Jima, “We Gotta Get Out of This Place,” REMFs, care packages from his mother, and baseball. Finlayson has a lot of good things to say about the Vietnamese people and military, which I found refreshing. Reading Killer Kane made me think of what my relatives must have gone through during World War II when Norway was occupied by the Germans. The Marines expended lots of energy in Vietnam in Peace Corps-like activities such as building wells and schools. It gave the VC something to focus their hatred on, I guess. I recommend you read Finlayson’s books in the order of publication. 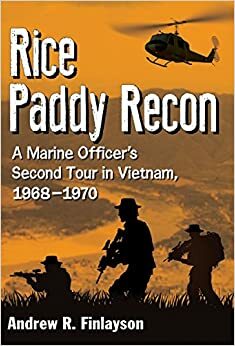 His second one, Rice Paddy Recon, is well written also, but does not start off with the author at the heart of the action. We don’t get that until about one third of the way through. Both books are almost over-researched. There is no off-the-cuff stuff here. Everything is carefully considered and backed up in all directions. Andrew Finlayson was the same way as a leader of men. The publisher, McFarland, has done the serious reader of Marine Corps Officers memoirs a service. These books rank right up there at the top of that genre’s heap. 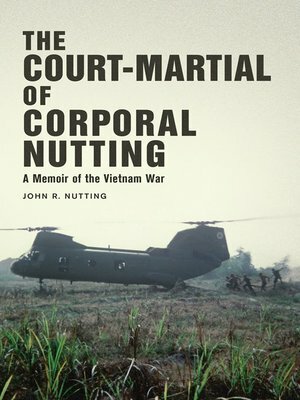 John R. Nutting wrote The Court Martial of Corporal Nutting: A Memoir of the Vietnam War (Skyhorse, 194 pp., $24.95, hardcover; $13.99, Kindle) with one purpose in mind: to set the record straight about his life as a Marine infantryman. Nutting’s book is an outstanding account of combat as fought by the Marine Corps north of Dong Ha during 1966-67. Nutting joined the Marines straight out of a small-town Idaho high school because his family had a military heritage extending back to the American Revolution. Leaving home for the first time, Nutting experienced a long list of “firsts,” including his first airplane ride and his first sauna/massage. His youthful wonderment and delight pervaded every new experience. His heart was pure. Serving in the 2nd Battalion, 3rd Marine Division in Vietnam, he saw people die in ways that easily could have shattered many minds. Several of the casualties were his closest friends. Nutting himself suffered shrapnel wounds and other physical injuries, twice spending time on hospital ships. Yet he endured. These kinds of mind-numbing events had to be filtered: “I could feel only so much, only allow in so much,” he writes. Best of all, Nutting remembered his fellow Marines by name and tells extraordinary stories about them. His accounts too often end with a pronouncement of how and when a Marine was killed. As a coping tool while in Vietnam, Nutting occasionally smoked marijuana with close friends hidden in a bunker between missions,and on R&R. He never used drugs in the field. Back in California, he was assigned to laboriously produce his unit’s diary. But on weekends he.succumbed to the vibrancy of the counterculture, “sliding into oblivion” with too much Scientology, wine, and reefer. Nutting’s brief association with two Marines on the verge of dishonorable discharges resulted in his court-martial for marijuana possession. The “green vegetable residue” found in Nutting’s possession was “so miniscule it could not be weighed,” according to two special agents who testified for the prosecution. All of this happened when commanders saw marijuana as the ultimate evil. Nutting waited six months through two nerve-racking delays before a board found him not guilty of all charges. Two weeks later his enlistment ended and he received an honorable discharge. Letters to his parents supplement Nutting’s narrative. To them, he wrote factual accounts of military shortcomings. Subsequently, his influential father used the letters to convince legislators to bring about changes such as rushing night-vision sniper scopes to Marine units. John Nutting writes prose that flows and he can turn a phrase, both dramatically and humorously. After seventeen days without a bath, for example, he describes himself as smelling “like an old wino’s socks.” He does not spend time explaining the obvious: When Nutting uses military vernacular, he footnotes its meaning in a few words and continues the story. If you liked Dominick Yezzo’s A G.I.’s Vietnam Diary, you will definitely enjoy Nutting’s book. Nutting, like Yezzo, projects a youthful exuberance tempered by the realities of combat. And—as Yezzo does—he shares details of his fascination with women. During the first five months of 1970, wherever the men of Bravo Company (3rd Battalion, 506th Infantry Regiment, 101st Airborne Division) operated, NVA troops seemed to be waiting for them. That was a time of what became know as Vietnamization when the South Vietnamese Army was supposed to be able to defend itself. Yet Bravo’s men found themselves in combat almost every day. Bravo Company participated in three big operations during early 1970. Its first assignment was to drive the 7th Battalion, 22nd NVA Regiment, 3rd Division off Hill 474, a Central Highlands stronghold. The hill lacked tactical significance beyond the one thousand enemy soldiers quartered there. In an initial sweep of the hill, four of Bravo’s men were killed instantly in an ambush. Bravo followed a routine of search and destroy tactics, battling the enemy, withdrawing, and starting over. Its encounters were grim and swift. By mid-March, hunting the enemy yielded diminishing returns as the NVA exfiltrated what had become a siege site. Reassigned to the Crow’s Foot, southeast of Pleiku, Bravo continued search and destroy operations. Enemy booby traps frequently supplemented ambushes. 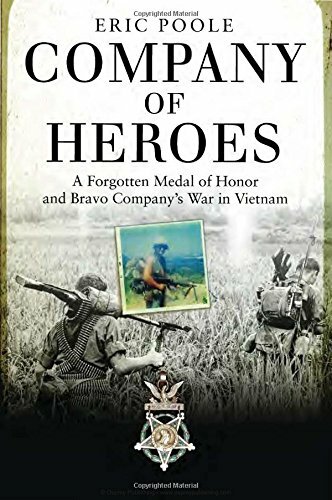 In one encounter, “Of the first ten men in line, [Richard] Clanton was the only one not wounded,” Eric Poole writes in Company of Heroes: A Forgotten Medal of Honor and Bravo Company’s War in Vietnam (Osprey, 296 pp., $24.95). Again, firefights were short and costly to both sides. Bravo’s next assignment was to support the incursion into Cambodia to cut trails that fed NVA supplies into South Vietnam. In Cambodia, Bravo found itself undermanned, outnumbered, and without air or artillery support. Nevertheless, in four days, Bravo found and destroyed an NVA field hospital, more than forty other buildings, tons of rice, and livestock. On the fifth afternoon, NVA soldiers trapped Bravo’s Second and Third Platoons in an open clearing, killing eight men and wounding twenty-eight others. During this encounter, Spec 4 Leslie H. Sabo, Jr. died in action nearly single-handedly fighting off a large enemy attack. That feat of valor earned him the Medal of Honor, but it was not awarded until 2012. The long delay resulted from the fact that the only account of Sabo’s heroism had been misplaced among his military records. The medal set the stage for this book. Author Eric Poole is a newspaper reporter from Ellwood City, Pennsylvania, Sabo’s hometown. Having never served in the military, Poole heavily relied on stories told to him by dozens of Bravo Company members who fought alongside Sabo. He conducted interviews from 2007-14. The book centers on Austrian-born Sabo and his family, detailing both civilian and military life. The story of Sabo’s family contains twists and surprises thanks to Poole’s excellent investigative skills. And Poole does the same with the men he interviewed. He weaves episodes from their pre-war civilian lives with what they experienced in Vietnam. Like Sabo, Bravo’s infantrymen were primarily draftees. Poole also recounts the stories of the eighteen Bravo Company members killed in action. He unobtrusively explains the history behind the war in general and gives details of battles, summoning comparisons from earlier conflicts. To close the circle, the book explains the effort related to rescuing Sabo’s paperwork. It also details the PTSD, divorces, and other emotional turmoil that combat gave to many of Bravo’s soldiers, their wives, and their widows after the war. More than two dozen of Sabo’s comrades attended the presentation of his Medal of Honor by President Obama. I believe that too many Vietnam War grunts never received the honors they earned. That is why books such as Company of Heroes are important. They chronicle people and events on the verge of disappearing. Along with Sabo’s medal, Poole’s book gives full voice to the exploits of Bravo Company, which have been overlooked for far too long.